>Igor Nosov has taken part at regional, all-Soviet and International Young Physicists’ Tournaments in 1988, 1989, and 1990. He shares rare documents and clarifies many details of the competitions. Igor Nosov was born in 1973 in Ashgabat, Turkmen Soviet Socialist Republic. He was an active science and technology amateur in his school years and took part in many Union-wide conferences, becoming a member of all-Soviet Society of Inventors and Rationalisators in 1988. He worked on aerospace engineering projects when a university student and kept his interests until today. Between 2004 and 2008 he led a small company selling machine tools. Igor Nosov is now representative of Kress Tools in the Volga region of Russia and boasts being an professional pneumatic drill user. I.N. You certainly know that the Tournaments in those years were organized with initiative from the Soviet Ministry of National Education and the Lomonosov Moscow State University. I can name several initiators of those Tournaments, Velikhov, Zatsepin, Yunosov; there was certainly someone from the Ministry of National Education, but I don’t remember the names on that level. I have preserved the copies of orders and prescriptions from the Ministry of Education concerning the YPTs. The top teams were from Physico-Mathematical School at Moscow Physics Engineering Institute and Physico-Mathematical School 18, Moscow, if I am not mistaken. I represented teams of regional scale and during these three years had to deal even with organization problems. The Tournament for me was a springboard. It is a unique event, very actual even today. It allowed me to develop an algorithm for behavior and analysis, and to well adapt to various life situations. Until today, I do not quit physics and continue my fundamental theoretical projects, even though I work in a completely different area. As far as I remember, there were teams from different countries. I personally contacted boys from Bulgaria and Czechoslovakia. These boys were making reports in Russian, but there were also presentations in English, I clearly remember that. I can clearly recall all successes and failures of my teams, as I was the captain throughout these three years. The third team I had, in 1990, was the strongest one. I.M. What teams did you represent? I am sending you all the documents that survived from the Tournaments. The problem sets and all other papers were thrown out by my wife as early as in 1992. I have a quality to always keep the information, and often look for something in my archive which weights 5 tons. My wife often refreshes it and I feel bad afterwards. I.M. The name of the center was Olympiets. Did all teams live there throughout the Tournament? I.N. Yes, only participants from Moscow possibly did not live there. The nightlife was sparkling with discos, videos and girls. I.M. Can you try to complete the list of international participants in 1988-1990? I.N. Unfortunately, I spent all Tournaments working on the problems and did not have time to make acquaintances. I never took part in the social life of the Tournaments, because I am more a lone person. I.M. Did you preserve the team diplomas as well? I.N. Our team leader confiscated the team diplomas. I am affraid they have not survived. I.M. How did you first learn of the YPT and how your team was selected? I.N. It all began when my supervisor at the Small Academy of Sciences of Turkmen SSR V.I. 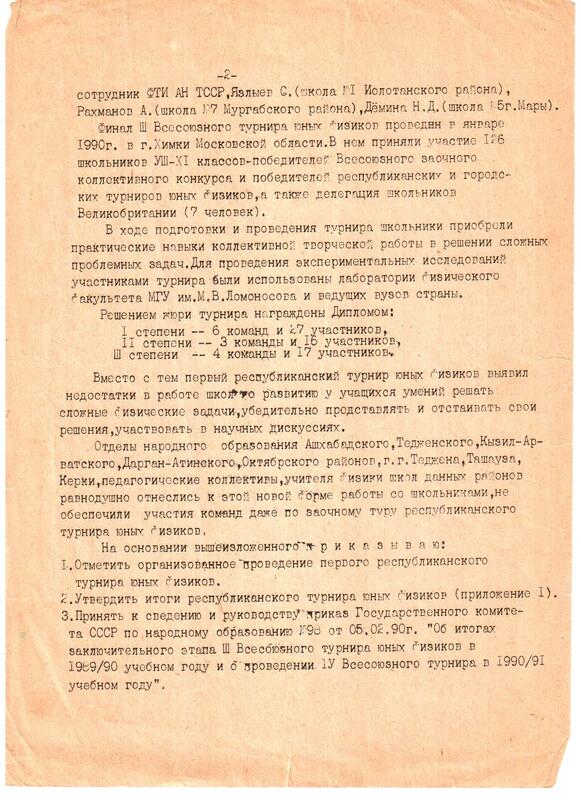 Karabash (a PhD specializing in solid state physics) announced at a lesson that a tournament in physics was planned in Moscow in 1988. That is why the first team all consisted from members of the physics section at Small Academy of Sciences, in Ashgabat. I received a small brochure with problems for the Tournament. Five participants and one team leader were required. Our supervisor knew personal capabilities of every participant, so he distributed the problems. It was reported to us, as always, “well in advance”, namely in two weeks before the Tournament. Our main problem was to get airplane tickets to everyone, it was more difficult than to solve all Tournament problems. I needed to run around offices of several officials in several governmental departments, and we succeeded to get the tickets in the end. In general, the idea and principles of the Tournament were an absolute novelty and were not known to anyone in the wide science community. That is why the authorities (I mean, republican) paid no attention to the composition of the team, to participants and to the team leader. It was important only to take part in the event. Most our solutions were on posters, like as solutions by other teams. There was someone who made reports with transparencies, I can recall overhead projectors. I.M. How the Inernational rounds in 1988 were organized? Was there a selection for the combined national Soviet team? I.N. There was no Soviet national team, I don’t remember that. There were just teams from many Soviet schools, and foreign teams. I.M. Can you suggest that the 1st IYPT had differences in organization in comparison to the 2nd IYPT and 3rd IYPT? I.N. The 1st IYPT and the 2nd IYPT were the most pompous. There was even a diner at Hotel Ukraina in the end, if I remember correctly. But my first debut in 1988 was not successful for me as my performances in further years. Everything was new to me, not like as at Olympiads. When I reported my solution, a juror told me that it was not correct to show calculated results with the precision of 4 or 5 digits after the decimal point, and my score was decreased due to that. Since then, even now, I never show results with the precision of more than one digit after the decimal point. I am attaching an address by Evgeny Pavlovich Velikhov. It was a separate sheet of paper, in a nice cover, and was distributed to all participants of the competition. I personally contacted a lot with Evgeny Pavlovich. 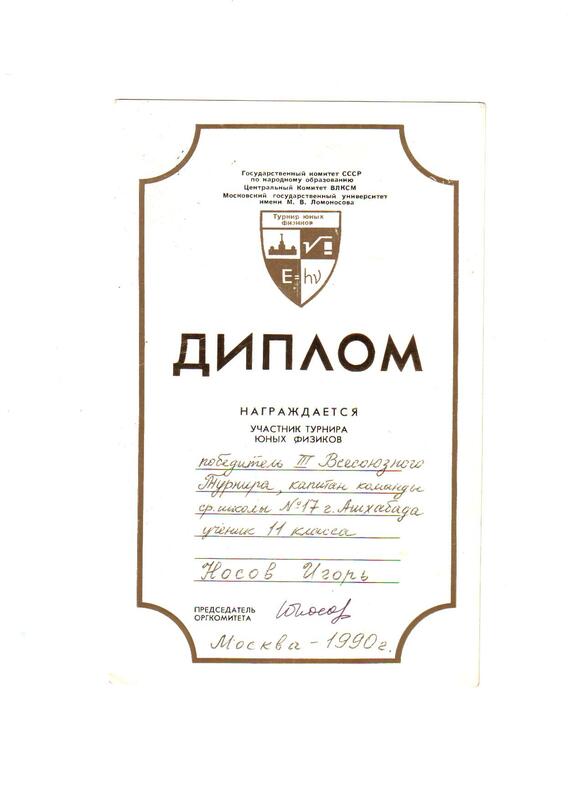 He was then very young, but already a member of Academy of Sciences, and personally signed diplomas. I.M. Can you suggest if international teams took part in all Selective Fights with Soviet participants? I.N. 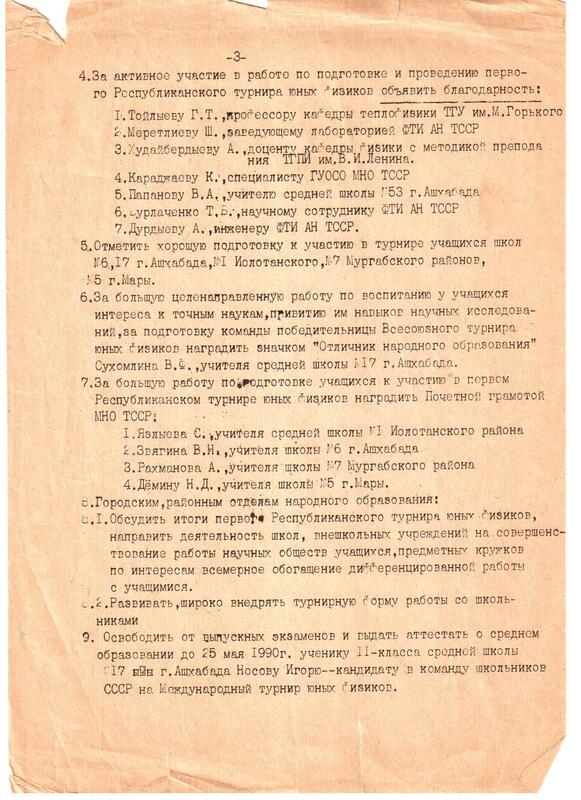 Check the list of problems for 1988. There seemingly was a problem on “Incandescent lamp” in 1988. That means, boys from Bulgaria were there in 1988, because I remember us and them at a Physics Fight discussing this problem. I.M. That clearly means that all teams, all Soviet and all international, played in all Selective rounds together. I.N. Ideologically, we played on an equal basis, together. I.M. There have been concerns about the problems discussed at all-Soviet and international rounds in 1989. If I am not mistaken, some problems at the correspondence rounds differed from the final problem set. I.N. In Moscow, we discussed exactly the same problem set we received in Ashgabat. But it was primarily important of how you solve something, not what exactly you solve. We were sometimes supplied with additional problems, “as a snack”, to see who and how can solve them without preparation. I.M. Can you recall any of problems you discussed in 1989? I.N. I remember the problem “Mosquito”. I refused to solve it as I considered this problem a bad joke. There was a problem about Karlsson. I personally solved it but saw that jury was not happy. They said, “the solution is too technical.” I solved the problem similarly to the helicopter theory, but there was strawberry jam instead of fuel. I.M. 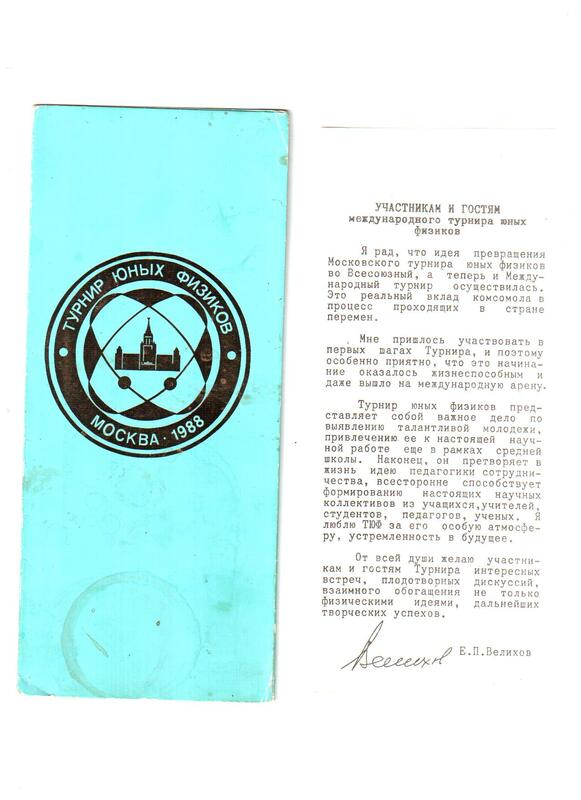 Am I right that in 1990, the IYPT was held as a separate event from the all-Soviet YPT? I.N. It was not held as such, at all. It was expected to be held outside USSR in May-June 1990. It was first planned to be held in Czechoslovakia, but there were political events there in 1990. Then, there were thoughts of London, but seemingly there was shortage of money. So finally, it was held in Moscow, in the same Olympiets Center. I.M. What problems did you discuss at Tournaments in 1990? I.N. 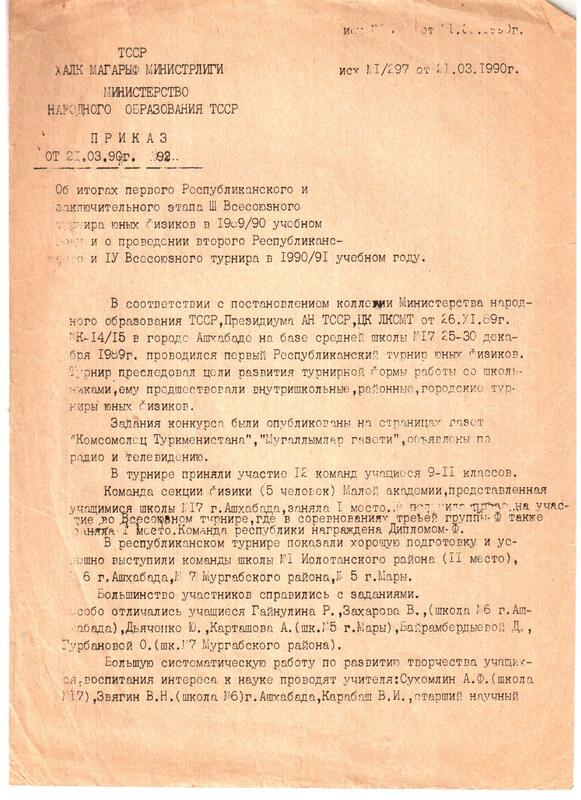 Once, I opposed the problem on the cylinder in a tube reported by the Physico-Mathematical School 18 from Moscow. They made a mistake because they made calculations for a tube opened from one end, but it ought to be closed, according to the task, so all dependences would be completely different. I got 5+ for that. But that was not in the combined team, we were in a Turkmen republican team during that Physics Fight. There was a problem on the Franlklin’s wheel, a reverse sprinkler, and it was very tricky. There was a problem on cubic planet, you must know it. I recently argued with an astrophysicist about this problem. I.M. 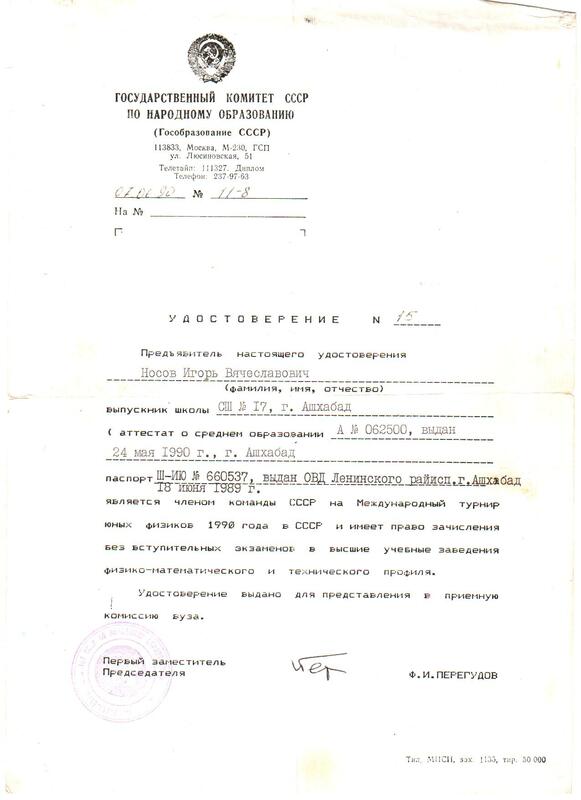 You were a member of a combined Soviet team at 3rd IYPT? I.N. Yes, I was. But I hardly can remember anyone from the team. We saw each other only several times. I went to the competition in Summer 1990. Out of Soviet teams, there was a combined team, a team from School 542 and School 18, if I remember correctly. I.M. I can suggest that there were students from Riga in this combined Soviet team. Can you confirm that? I.N. I cannot remember anyone from Riga. And why do you ask about Riga? I heard a lot about Odessa there. There was a very strong and very sociable boy from Odessa, but I don’t remember his name. I.M. So students from Odessa took part in the combined team? I.N. Students from various teams were in the combined group, but I cannot remember them, because there was no Tournament as such, I just saw them several times. I.M. How the combined team was selected? Did you take part in the combined team in Summer 1990? I.N. The physics fight with School 18 was when I was in a team from Turkmen republic, it has nothing common to the Soviet combined team. 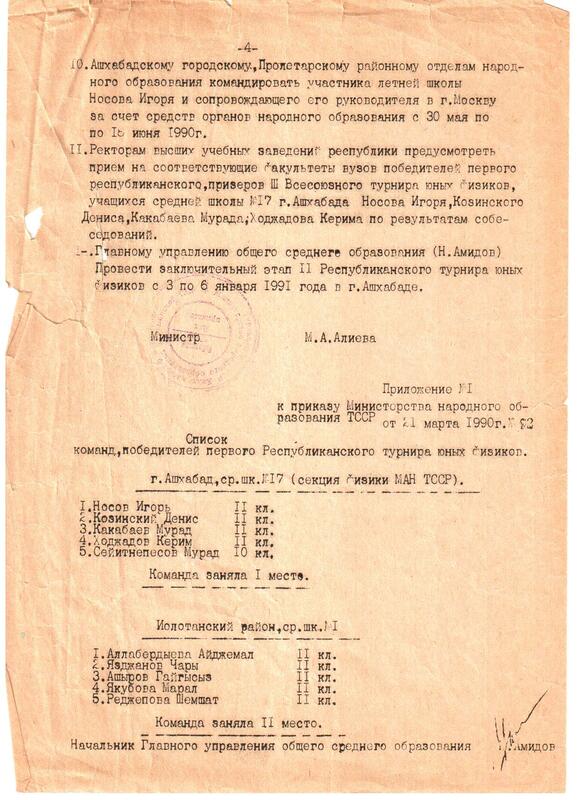 I was selected into the Soviet combined team in result of earlier achievements. And, yes, I went to join the combined team in Summer 1990. I.M. 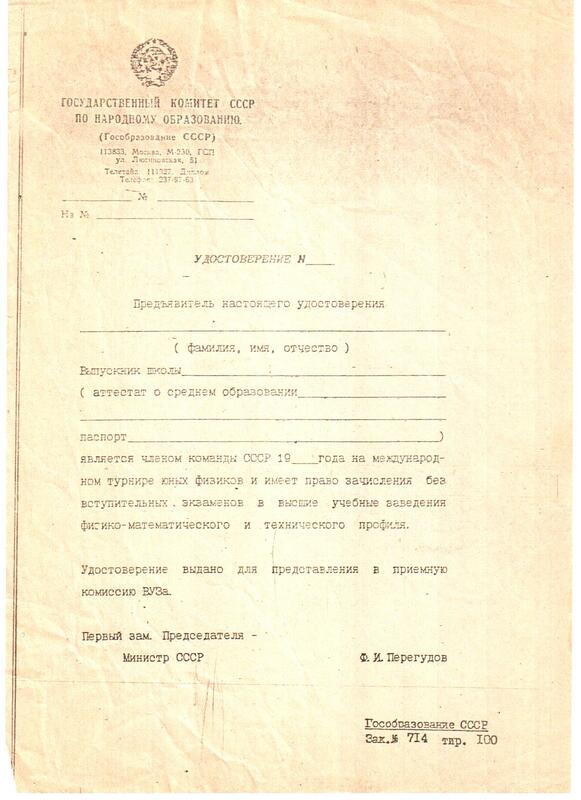 I am very impressed of the document allowing admission to any Soviet university without examinations. I.N. You know, when we got these certificates, we could no longer think of the Tournament. The diploma was returned to me from the archives of the University. The diplomas I got in 1989 were exactly as this one from 1990. And one from 1988 was more beautiful. I did not see the team diplomas much and do not remember them because they were immediately confiscated. The documents from the Ministry mention these personal diplomas as having different degrees. That seems strange to me because I have never seen any degrees on personal diplomas throughout the three years. I.M. Thank you for your help and for scanning these fantastically rare documents. I.N. If you succeeded in finding me, you will succed in finding the lists of participating teams. I remember only those I contacted personally and cannot be certain for entire list.